Very excited about today’s episode where I’m joined by Abhinav Ashtana, the creator and CEO of world renowned API client, POSTMAN. In this episode, hear Abhinav explain how POSTMAN started – how a personal frustration with API interactions presented an opportunity to create something cool. Learn about the journey POSTMAN took and the use cases that shaped its form today. Lastly, hear about the latest POSTMAN training capabilities shipping in version 7.0 (totally free) to better enable adoption by learning directly within the product as you use it. Take a peek at this capability in the POSTMAN blog here. Today we’re joined by Jason Edelman, co-founder of awesome network automation training and services company networktocode.com, and co-author of the recently published O’Reilly book titled, “Network Programmability and Automation“. 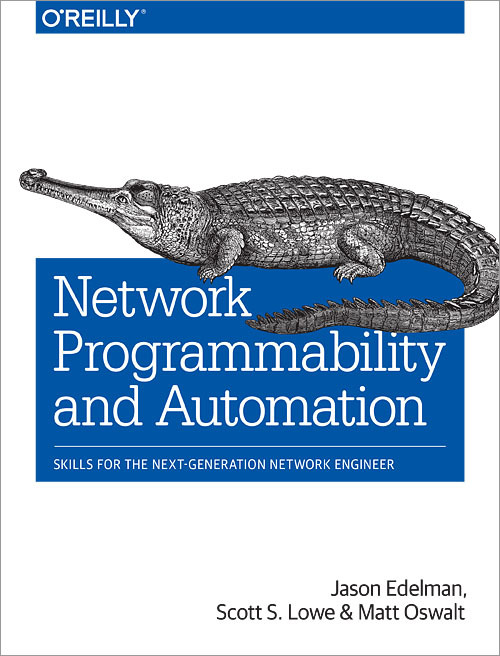 As the subtitle states, this book is a reference tool aimed at developing “skills for the next-generation network engineer”. Joined by co-authors, Scott S. Lowe & Matt Oswalt, the book covers many great concepts, including one pushed heavily by the f5.com/super-netops training program (and one of my personal favorites), the importance of abstraction and templating. Some great content from friends at World Wide Technology (WWT) explaining how the Super-NetOps Training Program differs from traditional infrastructure automation training. In this podcast, live from the WWT Global Sales Conference in Las Vegas, Principle Solutions Architect, Joel King, and Practice Lead for Application Delivery, Mark Wall, explain what the Super-NetOps training program is all about and why its so important. “That skillset gap is something that all of our customers ask about, and they struggle with. Traditional network engineers don’t have the programming background. They don’t have the understanding of some of the technologies around different data structures.” adds Joel King, “How do I train those engineers to be able to have the skills that they need to do the type of automated deployments that Mark’s talking about. That’s a big key area for many of our customers is, what skills do I need, what training, what education do I need, and thats one of the things that the Super-NetOps program is trying to address. To enable those engineers with new skills to be able to be successful”. WWT is supporting the Super-NetOps movement by putting together enterprise environments that support multiple technologies, beyond just F5’s BIG-IP, to help customers build end-to-end solutions. As I stated in my DevOps Enterprise Summit talk last year, “Give me a Swiss Army Knife, and MacGyver I do not become”. So, its great to see Mark and Joel building upon the initial Super-NetOps program and adding huge value to their customers. If you’re right at the beginning of your Super-NetOps journey, then this article is for you! A common question from our NetOps pals is, “How do you get started?” Well, let me take a stab at that in todays article. Before we begin, a few things to keep in mind. EVERYONE is starting from a different level. Focusing on who’s ahead of you in the learning path will only distract you from your success. This journey is about you. Go at YOUR pace. Making mistakes is good. Mistakes are evidence that you are learning new things and have the confidence in yourself to evolve. Learn more about a great culture for innovation from John Allspaw, here. <- A good one to share with the team! Beyond the tools and scripts, pay close attention to how you change your approach to troubleshooting and moving forward with a solution. Often overlooked, learning to automate without adopting and nurturing new practices and culture is almost pointless. Take the time to see how process changes and how you begin to look at challenges differently. We’ll look at more data formats, like YAML, in future posts. If you’ve worked through these exercises then congratulations is in order. You have already begun your journey towards becoming a Super-NetOps engineer! If you’re still feeling a little overwhelmed with these concepts, there is no shame is working through them again from the beginning. Repetition builds expertise and being comfortable with change is all part of the journey! Next in the series we’ll look at some more advanced POSTMAN features and then take what you’ve learned in POSTMAN and apply it to scripting languages.